Mother Nature is officially on my black list. I know what you're thinking: she wasn't already? I mean, Polar Vortex. And yes, that wasn't our best moment. I definitely was a little peeved about that one. And yes, the whole 80 inches of snow thing is a little over the top. But I am the one who moved from Florida to Chicago; I was asking for it. But now she's playing games with us, and that is just cruel. She got it up into the 50's this week and it was great. I can feel my nose! Look at all these puddles, all un-frozen and stuff! Life has meaning! I can see the light! But what does she follow that up with? So that's it. I'm done with these mind games. I'm done making silent bargains with her. I'm done promising her my first born in return for the end of this God forsaken season. I'm not sure what my next steps will be, but I can assure you that Mother Nature will not be involved. Sometimes, you need to know when to just walk away from a toxic relationship. And Big M. N., this is me walking away. So no matter what you're saying no to, pour yourself something strong and relax because I've got something here for you. We're all rooting for you! Especially these penguins, because nothing's stopping them either... especially not trip ropes. You've probably been dreaming about this since elementary school, right? Well, you wouldn't be if your childhood bedroom had looked like this. Good idea. So once you're finished making over your kid's room, move on to the rest of your house. As long as you're saying yes to penguins. Real pet penguins, that is. Turns out that the middle of your computer screen isn't the absolute worst place an ad can be. You'd fit right in here with us in Chicago. 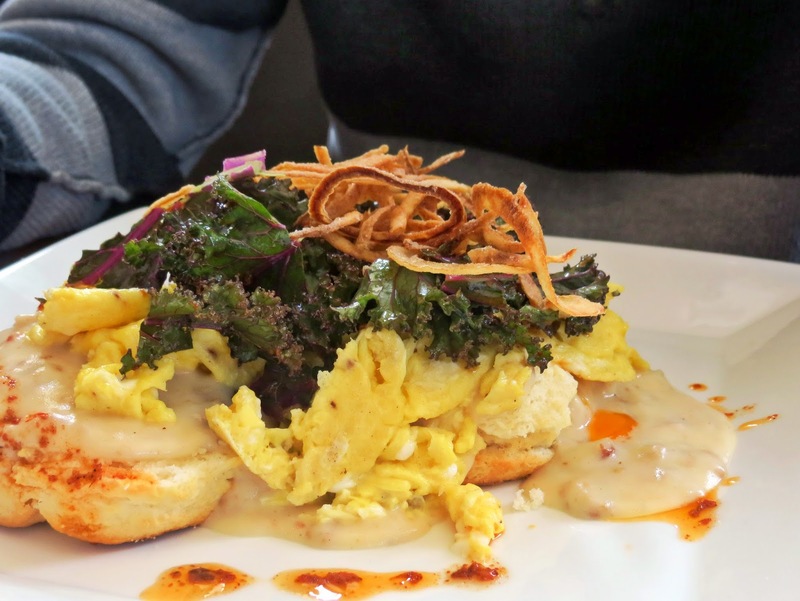 For my first brunch with Derrick in a month, I was so excited to try Southport Grocery and Cafe, a four-Yelp star Lakeview brunching hot spot. 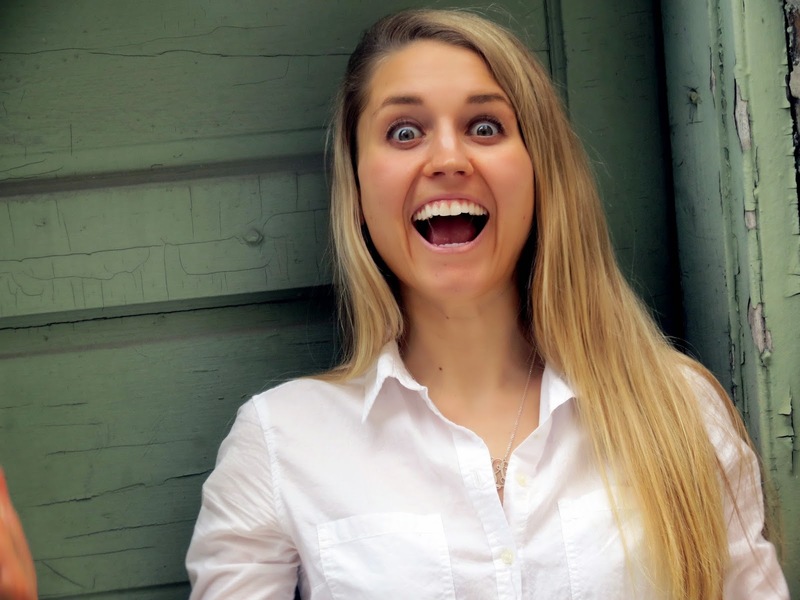 I mean, like, really excited. So you can imagine my frustration when they told us that the wait for two was about an hour and fifteen minutes. It wasn't pretty. Derrick was having none of it, and said that he didn't want to wait an hour to eat at a hippie grocery store. I, on the other hand, was having some of it and wouldn't have minded waiting. But I was also hungry, and could feel Nikki (my hangry alter ego) breathing over my shoulder. So I conceded my dream for another day. We had taken the train to get there though, and were out of our element. So we had to pull out the resourceful-guns and figure out a new plan. 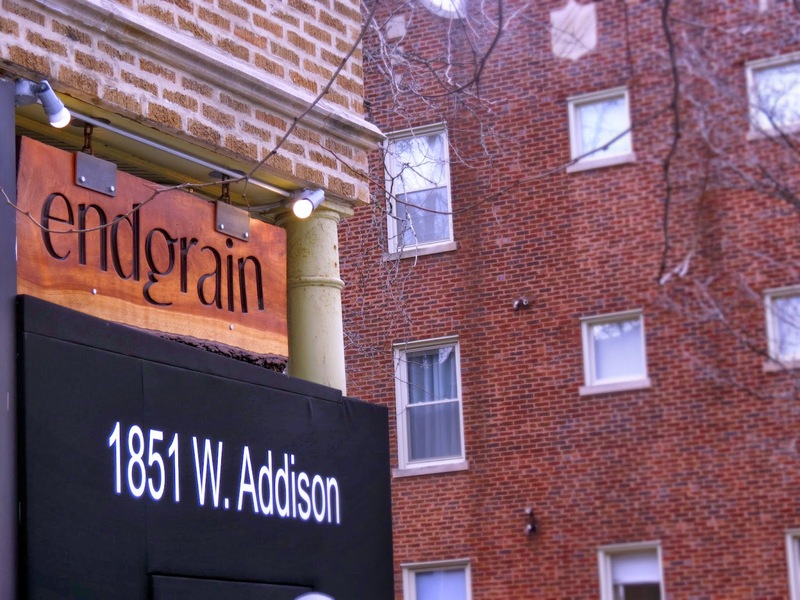 That plan led us half a mile over to Endgrain in Roscoe Village. If you ask me, our last minute decision was pure brilliance. I mean, they had homemade biscuits... on their Bloodies. 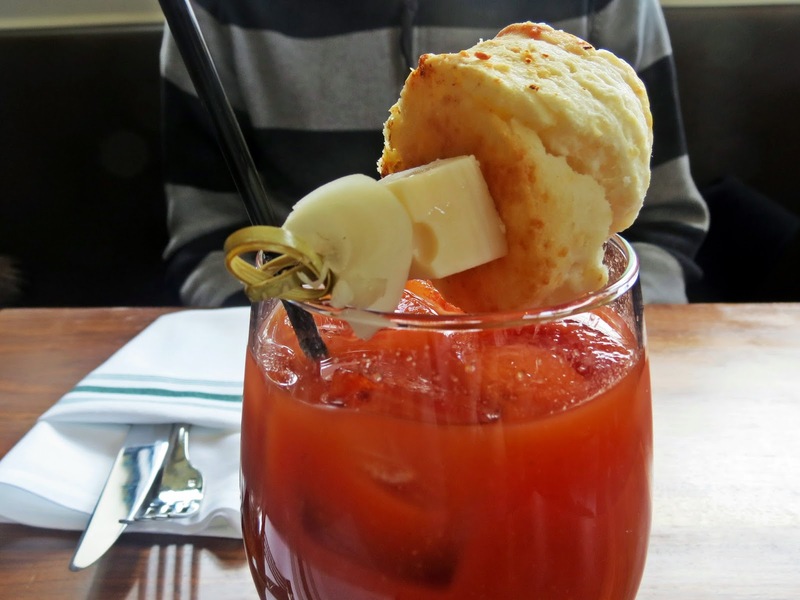 Let me repeat, biscuits on Bloodies. 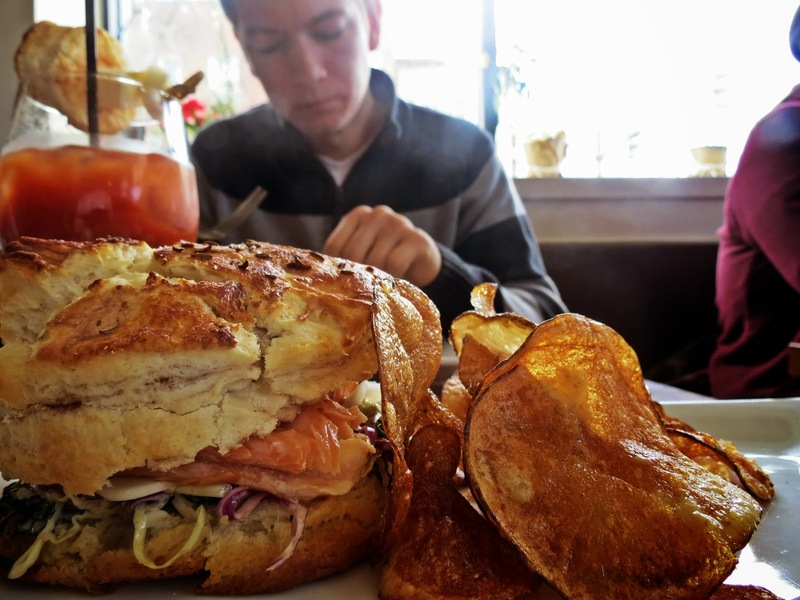 They also had "Smoked Arctic Char" (which looked suspiciously like salmon to me) on their homemade biscuits. And they had doughnuts. If there is a heaven, I'd imagine it's lined in caramel sea salt homemade doughnuts from Endgrain. Maybe I'm being dramatic, or maybe this doughnut was delivered by the hands of an angel. Derrick, on the other hand, was not impressed. I mean, he might have said a little prayer of thanks too after his first bite of the doughnut. But after that, I think he might have preferred the hipster grocery store. He ordered the biscuits and gravy which, in hindsight, may have been a mistake on his part. He has always said that biscuits and gravy is an art that is easily messed up. And from a man who has serious reservations about simple things like mustard or cheese, ordering a hit-or-miss dish at a place that serves "Smoked Arctic Char" was a bit risky. And the risk, unfortunately, did not pay off for my dear boyfriend. I knew it from the moment I saw those leafy greens of death. The incident was unfortunate and quite sad, and right after I finished relishing in the divine ecstasy that was my meal, I felt bad for the guy. Really. You win some, you lose some, I guess. Next week, we'll probably stick to something that's more at "IHop" on the hipster scale. Some place where they don't serve crispy onions on their biscuits and gravy. But then again, maybe the doughnuts will be enough to convince him to come back one day. I mean, biscuits on my Bloody. Seriously. If you see Mother Nature, kick her in the shins for me. 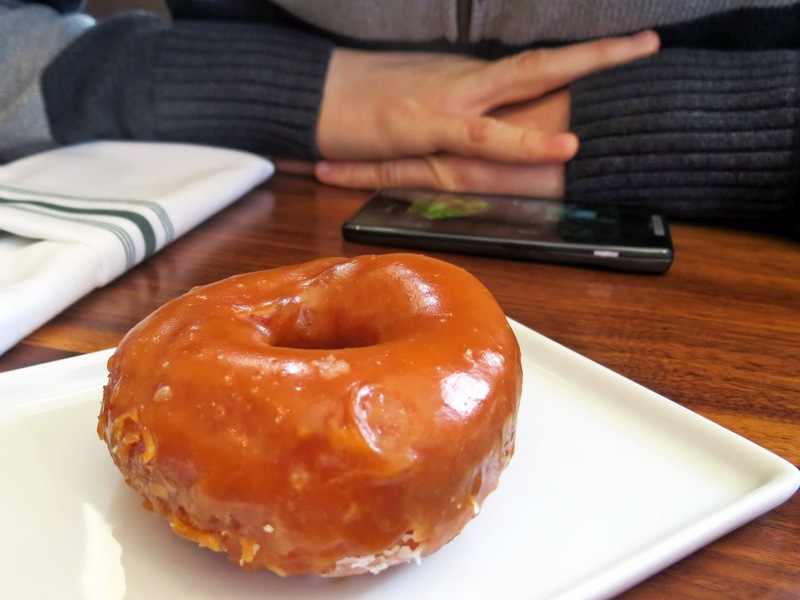 Oh my gosh, I'm so drooling over the salted caramel donut! Yum!